The Tories passed bill-C20 at lighting speed last year to add 30 new seats to the House of Commons with the aim of making things fairer for the country's fastest growing regions. Under the legislation, Ontario will receive 15 new seats for the 2015 vote, British Columbia and Alberta will get six apiece and Quebec will get three. The changes are expected to cost the feds an additional $19.3 million per year. 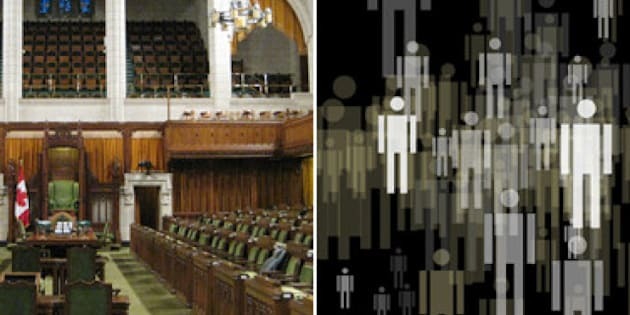 Now that the 2011 Canadian Census population figures are out, we decided to take a look at how fair things will really be under the new seat distribution bill. How Fair Is The Bill To Add Seats To The House? Ontario will gain 15 new seats under the Tory bill, bringing the province's total to 121. Ontario's population is now 12,851,821 people. Percentage of House: Approximately 36 per cent. Percentage of Canada's population: Approximately 38 per cent. Quebec will gain three new seats under the Tory bill, bringing the province's total to 78. Quebec's population is now 7,903,001 people. Percentage of House: Approximately 23 per cent. Percentage of Canada's population: Approximately 24 per cent. B.C. will gain six new seats under the Tory bill, bringing the province's total to 42. B.C. 's population is now 4,400,057 people. Percentage of House: Approximately 12 per cent. Percentage of Canada's population: Approximately 13 per cent. Alberta will gain six new seats under the Tory bill, bringing the province's total to 34. Alberta's population is now 3,645,257 people. Percentage of House: Approximately 10 per cent. Percentage of Canada's population: Approximately 11 per cent. Manitoba will gain no new seats under the Tory bill. The province currently has 14 seats. Manitoba's population is now 1,208,268 people. Percentage of House: Approximately 4 per cent. Percentage of Canada's population: Approximately 4 per cent. Saskatchewan will gain no new seats under the Tory bill. The province currently has 14 seats. Saskatchewan's population is now 1,033,381 people. Nova Scotia will gain no new seats under the Tory bill. The province currently has 11 seats. Nova Scotia's population is now 921,727 people. Percentage of House: Approximately 3 per cent. Percentage of Canada's population: Approximately 3 per cent. New Brunswick will gain no new seats under the Tory bill. The province currently has 10 seats. New Brunswick's population is now 751,171 people. Percentage of Canada's population: Approximately 2 per cent. Newfoundland and Labrador will gain no new seats under the Tory bill. The province currently has 7 seats. Newfoundland And Labrador's population is now 514,536 people. Percentage of Canada's population: Approximately 1.5 per cent. P.E.I. will gain no new seats under the Tory bill. The province currently has 4 seats. P.E.I. 's population is now 140,204 people. Percentage of House: Approximately 1 per cent. Percentage of Canada's population: Approximately 0.5 per cent.